Welcome to Drive More Safely, where Road Safety is our focus! 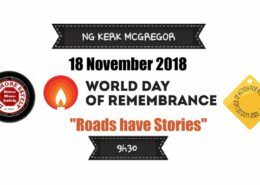 Death on the road does not only affect the economy, it has a devastating effect on the family of a road crash victim. It has a lifelong hurt and emptiness that never leaves the family. Road safety is NOT the responsibility of government. It is YOUR responsibility. the most dangerous is, it is you that took the “one for the road” and killed someone. Harsh you say………yes it is harsh, because every day a family is left with a permanent reminder of a crash that changed their lives forever. 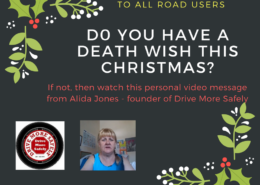 Drive More Safely can train road users,; we can educate road users; but unfortunately we cannot change their attitude – this is the reason for the devastation on our roads. Drive More Safely is a registered NPO where your safety on the road matters the most. 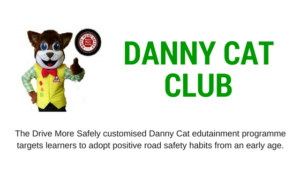 Children just love Danny Cat and learning about road safety! 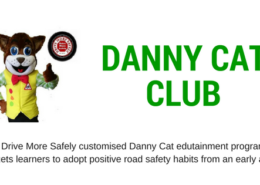 Why not let your child join the Danny Cat Club today! Close to 1.3 million people die in road crashes each year, on average 3,287 deaths a day. The leading cause of death among young people ages 15-29, and the second leading cause of death worldwide among young people ages 5-14 is due to Road crashes. Traffic crashes rank as the 9th leading cause of death and account for 2.2% of all deaths globally. See what is being actioned! Read more on what actions, organisations like the FIA’s ‘Action for Road Safety’ campaign are doing to improve road safety.